The longest continuous length we have in stock is: 8 feet. 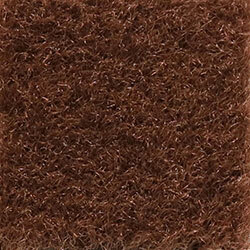 Aqua-Turf Marine Carpet is superior to standard indoor/outdoor carpets in terms of comfort and durability. This quality marine carpet is able to withstand constant moisture and dampness while still providing that soft-to-the-touch feel. Suggested Applications: boats, docks, decks, patios, poolside, automotive carpets and trim, basements, garages and anywhere where quality marine carpeting is needed. Pile Weight 14 oz./Sq. Yd. Olefin yarns are inherently stain resistant; however, a routine maintenance program is highly recommended to help minimize mold and mildew and increase the lifetime of the carpet. Use household detergent in a solution of warm water. Soak carpet lightly and allow it to stand for 5 minutes; then take a broom and brush the solution gently into the carpeting. Rinse thoroughly with clean water. Stains should be removed as quickly as possible.